On February 4th, the country celebrated 71 years of Sri Lanka’s independence. Freeing the country from foreign rule is of course an occasion to be jubilant. However, under the existing circumstance, the need of the hour is to do some stock taking and assess the country’s performance since independence to understand where we were during the time of independence, where we are today, who is responsible for the current mess and what needs to be done. During our independence Sri Lanka was an enviable role model for newly emerging countries in Asia, Africa and Latin America. With free education and recognized universities the literacy rate was high compared to many third world countries. Equally developed were health services that Indians visited the island for medical treatment. The country also had substantial foreign reserves, communal harmony and peace. Those were the days one could walk from south to north and east to west without the fear of being way laid. Sri Lankan is a multi-ethnic, multi-racial, multi linguistic, multi religious and multi-cultural society. The richness of this unique blend is enhanced by the presence of all great religions in the world such as Buddhism, Hinduism, Islam and Christianity. Members of all communities lived in harmony in the midst of one another. Each community practised and maintained its own religious and cultural life and their destiny has inevitably been interwoven and common. This enviable rare diversity naturally enhanced the natural beauty of the Island which has been described as Pearl of the Indian Ocean. Some even said that Sri Lanka has all the potentials to emerge as the Switzerland of the east. Today’s thriving Dubai was unknown and unheard of. Former Singapore Prime Minister Lee Kuan Yu said “Ceylon should be a model which other Asian regions should emulate”. The plurality of communities, religions, races, languages and cultures were God’s gift to this country. Sinhalese, Tamils, Muslims and all other citizens wanted to live in peace and harmony and move ahead as they did in the past. 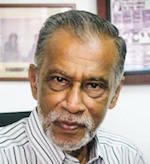 However it became a distant dream due to the short sighted racist politics of the two major political parties-United National Party and the Sri Lanka Freedom Party- which ruled the country since independence and divided communities for their political survival and brought about today’s chaotic situation. Sri Lanka lacked a visionary leadership which could think for the whole country and lead all communities as one nation and ensure the rights of all. Almost every political leader from the majority community in the post independent era thought in terms of the interest of the majority community .By promoting the majority community at the expense of the minorities, political leaders promoted their own interests with their target firmly fixed on the next general elections and not on the welfare of the coming generations and the national interest of the country. In doing so they sowed seeds of dissension within communities. If only the majority community had produced a visionary leader Sri Lanka would have been the envy of the entire Third World today. Tamils wanted to live in peace with other communities with equal rights. However racist politics isolated the minorities. Mrs Srimavo Bandaranaike’s republican constitution providing prime of place to Buddhism and Sinhala languages united Tamil political parties under the banner of Tamil United Liberation Front-TULF. Late President JR Jayewardene’s draconian constitution turned the country into an all-powerful dictatorship. It became a democratically elected dictatorship. The country is still suffering due to Jayewardene’s megalomania. Repeated violent attacks against Tamils culminating in the July 83 attacks led to Tamils taking up arms to fight for a separate state. This turned the country into a killing field. While innocent people died and the country as a whole suffered, politicians and their sidekicks flourished in the form of commissions from weapons purchase. When the war ended in May 2009 all expected politicians to learn from three decades of carnage and undo the damages. It was a rare historic opportunity to bring communities together and move the country ahead leaving the bitter past behind. It was no easy task due to three decades war, deaths and destruction. Battered and wounded Tamils were also looking forward to some gestures from the government which would have paved the way for reconciliation. Instead there emerged worst form of racism, crime, corruption and lawlessness. While Tamils were vanquished racist politicians turned their agenda on Muslims-the second largest minority living scattered all over the island. Racist elements were given free hands to unleash violence against Muslims, frighten and suppress them. Drunk with power from the victory over LTTE, the government unleashed a wave of terror. Racist thugs attacked Muslims, burnt businesses, homes and mosques causing destruction for no valid reason. In fact it was often said “we will deal first with Tamils and then take care of Muslims”. As part of this madness there emerged “Greaseyakkas” persecuting Muslim women when men went for night prayers during the Holy month of Ramadan. These senseless attacks culminated in the destruction at Aluthgama, Beruwala and Dharga Town where commercial and residential buildings were looted and burnt. There was an overall atmosphere of fear due to crime, corruption, white van kidnapping, lawlessness and the like. It was in this gloomy atmosphere that Minister Maithripala Sirisena left President Mahinda Rajapaksa’s government. He teamed up with UNP leader Ranil Wickremesinghe and went to the country promising that he would introduce a government of good governance and bring all those who committed crime and plundered the country to justice. To free from Rajapaksa reign, people voted President Maithripala Sirisena and Prime Minister Ranil Wickremesinghe to power. However they miserably failed to fulfil their pledges. No one accused of crime and corruption was brought to justice. People were fed up and did know where to turn to. In the midst there emerged rift between President Sirisena and Prime Minister Wickremesinghe dealing a deadly blow to the hopes of the people. Bond scam involving Prime Minister Wickremesinghe and the related vote of no confidence shattered the country. Parliament was once an inspiring centre of knowledge with highly educated and cultured representatives who were legendary intellectuals of great integrity and made great contributions. Recent hooliganism in the parliament speaks volume for the present sorry state of affairs. Seven decades after independence today Sri Lank is one of most mismanaged countries in the world. There is political chaos, serious economic crisis, social unrest, rampant corruption, communities remain divided with the gap continue to widen, violence unleashed against Muslims killing innocent Muslims and destroying their economic base perhaps to please Sinhala racist elements, ever widening economic gap, disintegration and the collapse of social order. The highest allocation of Rs 390.3 billion is for defence in the estimated government expenditure for 2019 .This is colossal sum of money which, otherwise, could have been used for raising living standards of people. Our defence budget during independence was insignificant. Sixty years later in May 2007 Indian Nobel Laureate Amirtaya Sen, rightly said that Sri Lanka failed to realize how precious and valuable the richness of the country’s plurality was by taking a position of upholding exclusive status to Buddhism and Sinhalese and isolating the other sections of society from having a sense of national identity. In his independent day message President Sirisena said that the common enemies of the progress of national revival were poverty and corruption. The question is that he was in power for more than four years and what has he done to eradicate poverty and corruption. Absolutely nothing. He had all the opportunity to bring the corrupt to law. He refused to so. Chief Incumbent of the Getambe Rajopawanaramaya Ven Keppetiyagoda Siri Wimala Thera told Central Province Governor Maithri Gunaratne that “a chaotic situation has arisen in the country and President Sirisena should take the responsibility for all these. He cannot get away from his responsibility”. Elections are round the corner. Are we going to bring the very same corrupt and criminal elements to power? Well known columnist Jehan Perera said the challenge for Sri Lanka is to create a set of common political values that members of all communities can accept that are based on respect for human rights and the rule of law. This is the process that needs to be speeded up through a new constitution that will create citizens who are politically equal, not subjected to discrimination and with the right to determine their own future within a united country whether the constitutional label is unitary or not. There is disillusion everywhere. People of all communities who wanted to bring up their children in a cultured environment now ask-what is the future for the next generation. Some wanted to migrate. How many could do that? This is the reason why independent day should also be a day for stock taking of our performance for the people to know where we are and what needs to be done. The independence day is independent for only few families who already had powerful status within British rulers. For majority of the People this is not an independent day. Most of the Sinhalese are in the dark during and after that day. Their sons and daughters are dying every day in order to keep those families in power and continue to rob the nation. On February 4th 1948, Sinhalayo and Vedda Eththo who are the native people in this country gained independence from Western colonial ‘Awajathakayo’ and Demala Vellala elites who are the descendants of slaves brought by colonial parasites. These Demala Vellala elites licked the a*s of British and gained control in the administration and oppressed the majority Sinhalayo. Thanks for your historical description theory. Unfortunately even most of the Sinhalayo historians or religious people do not accept this theory and they still believe they are orginally from Indio and it Sinhalyo are invaders and Buddhism is from Indio. Don’t you think Buddhists are not natives of this island we should send them all to Indio? Do you know whether Vedda Eththo or Sinhalyo are the first natives of this island and what language the Vedda Eththo spoke? Have you Sinhalayo licked the a*s of Vedda Eththo to get control of this island? As usual, Thambis measure success of the country only by government’s open efforts to further elevate them to the top of the economic and property tree of this country. They haven’t done too badly without government assistance as LaThief is saying here!. Any one interested in finding out take a walk down Galle Road from Galle Face to Mount Lavinia and beyond. They are still complaining! Obviously not enough! So what is the final solution? Independence? What does it mean? How important is it? Have we got better or worse after gaining independence? In which areas? Firstly we need to realize independence is not freedom. It’s the opportunity to operate independently as a state, to fulfill our own agenda. Independence is important only if you are mature enough to understand the way the world works. The time we got independence the leaders were just some pawns of the British Empire. They were shaped by the British values, and educated to help the British system thrive. In my opinion we have not got better in any area at all. I don’t think our education system and values have been carefully designed to support the future of our country. We produce many excellent Doctors and Engineers who are not supporting to build the nation. But most are helping other nations or helping their own personal agendas. Rest of the sectors are no different. Companies are free from the system to maximize profitability while no public or government pressure on them to be ethically sound. We need to make long term planning to stabilize the direction of the nation. We need to elect a committee which includes all sectors of society and education to steer the country forward. I know it’s sounds like an impossible task but we need to make it happen, whatever the cost. I don’t know how but I’m sure if we come together as one we can easily find the path. First step is to say no to corruption and to the corrupt. Second step is to say yes to the Righteousness and the righteous. Third step is to strive to say no to the greed and the greedy. You write, “Freeing the country from foreign rule is of course an occasion to be jubilant.” But, according to your article, everything was better at the time of independence. Is so, how is independence an occasion to be “jubilant”? Isn’t “mourning” the more appropriate word? Independence from what or whom? We were theoretically slaves under the British till 1948 but practically slaves ever since under Power Hungry and Corrupt Politicians of all hue and cry. Wither Sri Lanka. According to this religious fanatic Latheef Farook, Sinhala Buddhists are responsible for everything that went wrong in this country. Hands of Demalu and Muslims are clean. Sheer BS. Who started the first Sinhala Muslim conflict in this country? It was Muslims and as a consequence of that British colonial bastards massacred hundreds of Sinhalayo using Dravidians who served in the British army. Who started the Sinhala-Demala conflicts? It was Demala Vellala elites who lost the privileged status they enjoyed by licking the a*s of British. In most of the conflicts between Sinhalayo and Muslims or Sinhalayo and Demalu, first stone was thrown either by Demalu or Muslims. # King Gamini Abhaya (aka Dutu Gemunu) made a blunder by allowing Dravidians brought by invaders and colonized Sinhala land in the North to stay in Sinhale. # King Senarath made a blunder by allowing Muslims who were persecuted by Parangi to settle down in interior parts of the country. # The Government that took control after gaining independence made a blunder by not sending back the descendants of slaves brought to Sinhale illegally by colonial rulers to Portugal, Holland or Britain. A very good summary of the SL story/History so far. There is a need for Buddhist clergy to direct the Politicians in the RIGHT way. They too have become partisan and happy to take the financial aid from the CORRUPT politicians. The Buddhist Clergy needs to have a Council that could regulate and discipline the errant clergy who are just THUGS who are robed. Their illegal activities are not CHECKED by Police or other Security Forces in some cases AIDED by them. These all make the REASONABLE citizens of SL very very SAD. There is no stock to take exepect the one which is foating in River Kelani which is Sinhala Lankas SOVEREIGNTY which was flushed down by Mahintha . Having achieved that as punishment for betraying India by selling parts of Sri Lanka he then decided to set off on a So Called historic trip to Indias heartland hoping to meet the Leadership in Delhi. But that was rebuffed by Delhi . Meeting with Modi was never going to happen after he snubbed Mahintha when he visited Colombo. Mahintha I am told then tried his level best to at least arrange a meeting with Defenece and Foreign. Ministers. That was point blankly rejected by Delhi. My sources in the South tell me that some Sinkalams in the South paid millions to a fixer and arranged to set up a meeting with low level politicians to give a speech to save face. No doubt what the subject is going to be. It will be all about how my killer son managed to marry Tamil( Slouch) girl who has now become my Daughter in Law doing household duties . We the Tamils and Sinkalams live happily ever after while my Soldiers are Roaming the North occuying Tamil Land by force.